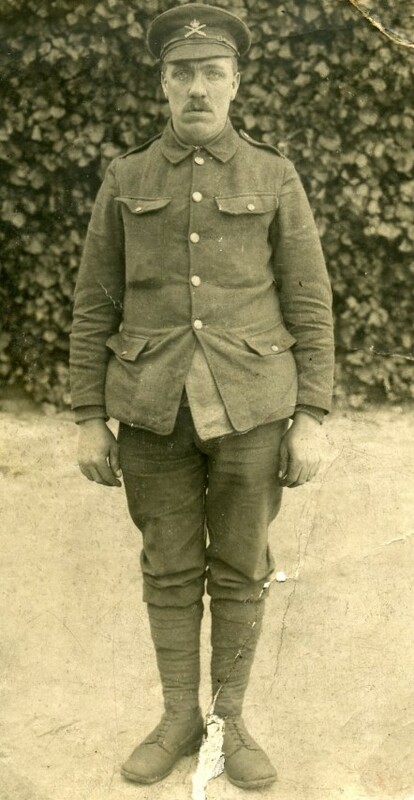 71150 Private John Joseph Hope 43rd Company Machine Gun Corps (Infantry) was killed in action 24 August 1917 and is buried at Hooge Crater Cemetery. He was 38 years old, married and had 3 children. 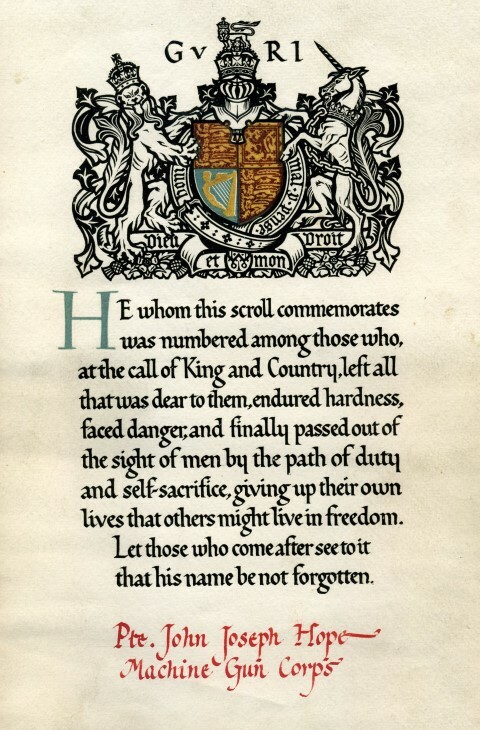 He is also commemorated on the Cockfield War Memorial. 43rd Machine Gun Company formed 16 February 1916 and left to move into the 16th MG Battalion 1 March 1918. The 6th Machine Gun Battalion was formed 1 March 1918 and was with the Divisional Troops associated with the 6th Division. Until the winter of 1917-18 British machine guns were deployed in companies with a company attached to each infantry brigade but from about the beginning of March 1918 machine guns were re-organised into battalions, one to each infantry division. Prior to January 1918, the machine gun companies were attached to infantry brigades (or squadrons attached to cavalry brigades) and were armed with 16 Vickers guns (Cavalry MG Squadrons 12 guns). They took the brigade number ie 19 MGC, the company of the 19th Brigade. There were 288 Infantry MG Companies and 26 Cavalry MG Squadrons. A Major became the Brigade MGO, a Captain commanded the Company of 16 guns. A MGC consisted of an HQ, 4 Sections of 4 guns and a Transport Section. Sections were divided into 2 sub-sections each commanded by a subaltern, the senior being the Section Commander. Sub-sections each had a Section Sergeant and a Section Corporal. Transport Sections of mule drawn limbers for guns/ammunition were larger than an infantry battalion’s transport. Cavalry MG Squadrons had 6 no. 2 gun sections. Signal Officer – Subaltern (an officer below the rank of Captain) thus Lieutenant or Second Lieutenant responsible for communications between division, battalion company. Signallers trained in the use of telephone, Morse code and semaphore. Transport Officer – Subaltern Transport – horses/mules, limbers/carts drivers/grooms, shoe-smiths etc. Quartermaster – Subaltern, battalion supply department, collect /deliver rations, fodder/water, clothing etc. store-man, armourer, cobbler, carpenter and cook. The German retreat to the Hindenburg Line: 14 March – 5 April 1917. Between 19 March and 28 March 1917, Private J.J. Hope was in hospital but it is probable upon his discharge from hospital, he saw action. Ernst Junger, born in Heidelburg in 1895 and who served throughout the war with the German Army, the Rifle Regiment of Prince Albrecht of Prussia (73rd Hanoverian Regiment) wrote his autobiography, “In Stahlgewittern” (Storm of Steel) 1920 and included his account of the retreat to the Hindenburg Line – the Germans referred to this defensive line as the Siegfried Stellung. The Arras Offensive. The First Battle of the Scarpe: 9 – 14 April 1917 and the Third Battle of the Scarpe: 3- 4 May 1917. It is probable that Private J.J. Hope saw action. He was in hospital between 27 May and 16 July 1917 after this offensive. Local Operations around St. Julian: 22 August 1917. Many Divisions visited the Ypres Salient during the 3rd Ypres and on more than one occasion. A total of 54 Divisions were thrown into battle. For example, the 11th saw action at Langemarck, Polygon Wood, Broodseinds and Poelcapelle. The offensive cost the British nearly 310,000 casualties, the Germans slightly less and it consumed all of the available reserves. On the 6th November, the village of Passchendaele was entered and the whole campaign ended a few days later when more of the ridge was taken. It achieved none of its objectives although the Germans could no longer look down on the Ypres Salient which had been deepened by about 5 miles and they had been prevented from attacking the French when its army was in disarray following the failure of the Nivelle Offensive. 18 July, a massive artillery bombardment commenced. The attack itself began 31 July when the British Fifth Army attacked north-east from the Ypres salient. Initially, good progress was made but a strong counter-attack resulted in only a 2 mile advance. Heavy rain fell on the first night flooding the swampy ground whose drainage system had been totally destroyed by the 10 day bombardment. As a result the whole operation was held up. “So desolate, so meaningless were these August struggles that the record of them in histories and memoirs fill one with a certain weariness. Listlessly the men assemble at the jumping-off tapes. Behind the same familiar barrage they advance through the same narrow porridge-like strip of ground. The same hidden machine-guns greet them; the same whiz-bangs open up at them. Here and there a strong-point is captured, a new outpost is reached, to which a few riflemen forlornly cling. Some of these are held, and occasionally the line is advanced a few hundred yards. Brownish masses of German troops slog forward and everywhere nasty hand-to-hand encounters take place. The men on both sides are lacerated and punctured, bleed and die, in numbers that baffle the imagination. Nameless new beings take their place, but nothing else changes. “WANTED. – To rent for the winter season, DRY WARM DUG OUT. Must be commodious and in healthy locality; untroubled by hawkers and Huns….. Apply: Reggie, c/o of this paper. FOR SALE. – TWO TANKS. Slightly soiled. Price moderate. Or would exchange for a pair of rabbits. FOR SALE – PLEASANT COUNTRY ESTATE, situated in one of the nicest parts of Belgium. Heavily wooded. Has been shot over. Owner desirous of leaving. Haig instructed Gough to attack again and he did so 22 August but in an extremely limited fashion. There was fighting every day. The rain continued and August was the wettest for 30 years. Some gains were made but the II Corps (of which the 14th Division was part) was as stationary as ever at the base of the Gheluvelt Plateau. 27 August: another effort – it failed. Again and again during August there were attacks followed by German counter-attacks. Inverness Copse changed hands 18 times. Between 31 July and the end of August, the British and French lost some 74,000 men and the Germans about 50,000. 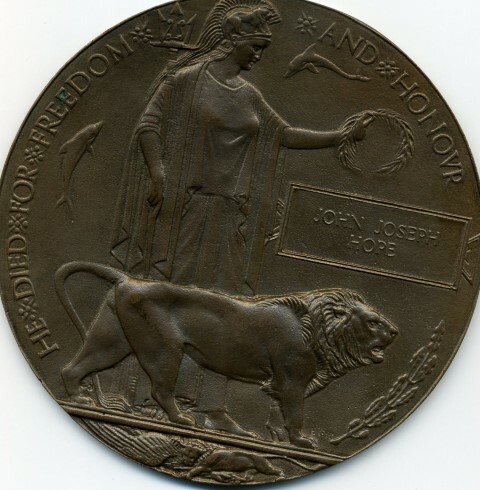 Private J.J. Hope was awarded the British War and Victory medals. 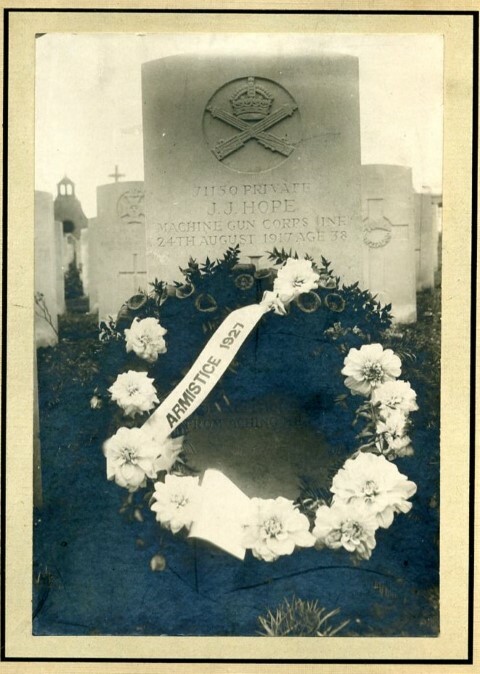 Private J.J. Hope is buried at grave reference VI.K.16 Hooge Crater Cemetery, Belgium. 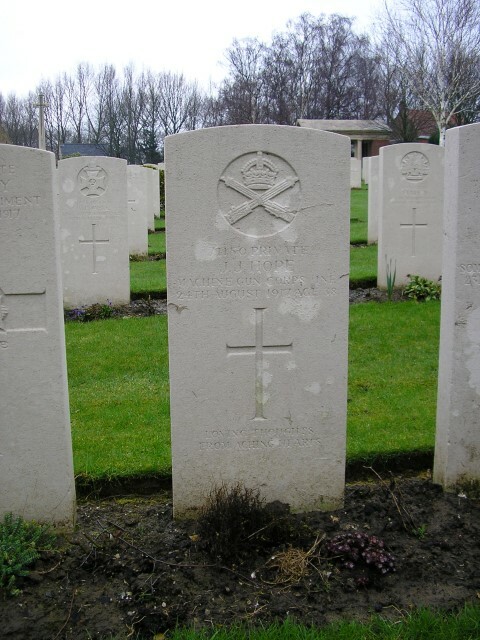 Originally, he was buried in the vicinity of Veldhoek but 31 May 1926, his wife was informed that it was necessary to re-inter his remains at Hooge Crater Cemetery. The total number who served was some 11,500 officers and 159,000 other ranks of whom 1,120 officers and 12,671 other ranks were killed and 2,881 officers and 45,377 other ranks were wounded, missing or prisoners of war. The memorial is located at Hill 60 overlooking the town of Ypres, Belgium known as Ieper in the native Flemish tongue and Wipers to the British Tommy.